Sunday Mornings: Bible Study, 9:15-10:40 a.m. & 10:45 a.m.-12:00 p.m.
Bible study classes are a central space for faith formation and spiritual development and are provided for children of every age. Each class is taught by caring adults who use a biblically-based, developmentally-appropriate and student-centered curriculum resource as a springboard for conversation, learning, activity, and guided play. Provision of basic needs and the development of trust are foundational to a life of faith. This begins in infancy as children encounter caring teachers who offer love and care in our Infant classroom. Children enter the Toddler classroom as they begin to walk. There they continue learning that they are a special and unique part of God’s beautiful creation. Toddlers gather for simple prayers, songs, Bible stories, and guided free play that further enhance the essential foundations of faith. As children enter our Twos Classroom, they are beginning to encounter the biblical story through developmentally appropriate centers. Children examine God’s creation and become aware of their place in creation as they grow, love, and can offer care and compassion to others. 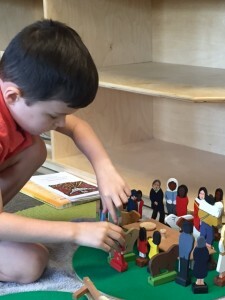 Centers change weekly, and children work toward gathering as a group as the Bible story is shared. Threes and Fours build on the foundations of faith developed in infancy and the toddler years by engaging with and encountering a wider scope of Biblical stories. 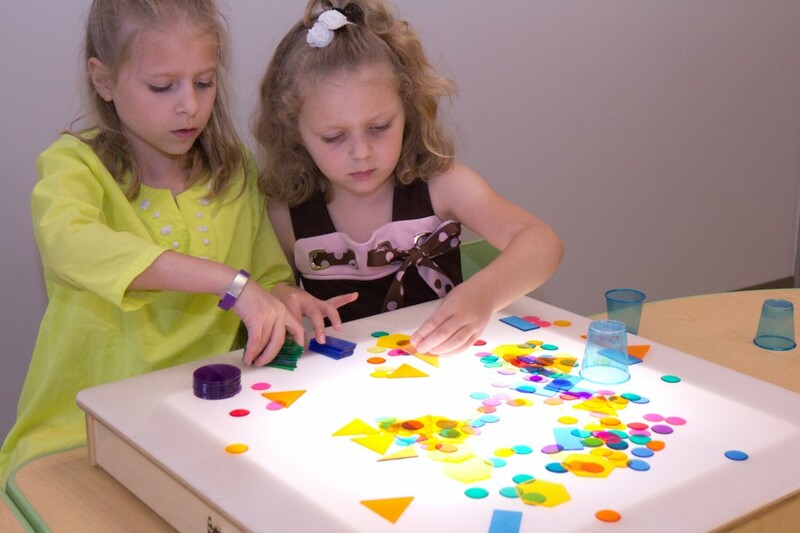 Participation in learning centers, guided play, group story, tasting experiences and art activities allow children to engage with the biblical story in a variety of ways that address children’s unique learning styles. 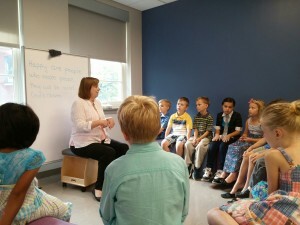 As children move into elementary school, specifically Kindergarten through 5th grades, classes are designed to dig more deeply into the biblical story. While the stories may be familiar at this point, children are encouraged to encounter the story anew and discover how God’s story influences their daily lives. Younger Elementary classes participate in activities designed for beginning readers and involve active movement and creative interaction with story. Middle Elementary classes experience new ways to encounter God through journaling as well as reflecting on and memorizing important prayers and verses. As they are beginning to learn abstractly, Upper Elementary students examine the chronology of the Old and New Testaments, which leads to an understanding of the intricately woven story of faith depicted in the scriptures. During our 8:30, 9:30, and 11:00 a.m. Sunday services, worship care is provided for infants, toddlers and preschoolers (pre-kindergarten). An incredible staff of dedicated volunteers – including parents, grandparents, teachers and others called to nurture children in faith – staff our classrooms during these worship hours. Worship Care Captains serve as point persons each Sunday of the month as well. Each volunteer who serves with children on a regular basis has gone through a volunteer screening process, which includes a background check. We also utilize a safety sticker system, which uses a common number to connect you with your child and his/her belongings. This safety sticker is filled out when you drop off your child and is required to pick up your child at the end of the morning. 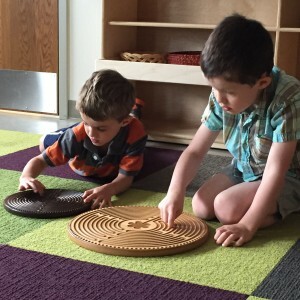 Each week, children ages 3, 4 and pre-kindergarten have the unique opportunity to participate in a contemplative encounter with scripture through Godly Play. As children encounter the stories of scripture, they are encouraged to wonder aloud about what they have heard. This process of hearing and wondering allows children to learn by discovery, to learn how to create sacred space, to build and work in community, to learn and develop a religious language that helps them encounter God, and to learn to use that language to find meaning in their lives. For more information about Godly Play, please visit www.godlyplayfoundation.org. Children in Kindergarten thru 2nd grade are invited to join us during our 11:00 a.m. worship service, just before the sermon, for a specific time of contemplation and quiet designed just for them. Together, we hear a story or central thought for the day or season, followed by time spent in still, self-directed application of what has just been learned. This application happens through tactile stations using books, sand, art materials, and objects that draw us close to God (candles, crosses, finger labyrinths) so that we might listen for and respond to God in a contemplative way. Children’s worship does not meet on Communion Sundays so that our children become familiar with this important ritual of remembrance, coming to the table together as a community of faith. Wednesday Nights: Music and Mission, 6:00-7:15 p.m.
We are blessed to have a graded children’s choir program with adult leadership who are musicians, know and love children, and support the Music Ministry of Highland Baptist. Programming is provided on Wednesday evenings from 6:00-7:15 p.m. Childcare is provided for children (birth through 5th grade) whose parents are in Sanctuary Choir from 7:15 until 8:45 p.m. Advance sign-up is required for this extended childcare by contacting Kathy Collier. Highland offers a wide variety of musical options for children. You can learn more about each of these groups in the Music Ministry section of this site. Highland Baptist Church wants to provide a safe and healthy environment for all children to learn and explore without threat of serious injury or illness. Parents/guardians and staff can have confidence that continuous monitoring of the physical environment, equipment, and materials is taking place as well as careful care-giving practices and appropriate supervision of children. In addition, all regular volunteers working with children at Highland have participated in a volunteer screening process, including a background check, according to the Policies for Protecting Minors developed by the Trustees. Highland utilizes a child security sign-in system. Each child, birth through age four, is required to be signed-in by a parent/guardian. The parent/guardian will receive an identification label with a number on it. The child will have the same number attached to his/her clothing. The caregiver will remove the label from the child and release the child to the parent/ guardian upon presentation of the identification label at time of pick up. This system is enforced during all church activities that require childcare.